"Sun Kissed." (coyote) Oil on Canvas, 36 x 48 inches.©Karine M Swenson2018 SOLD. 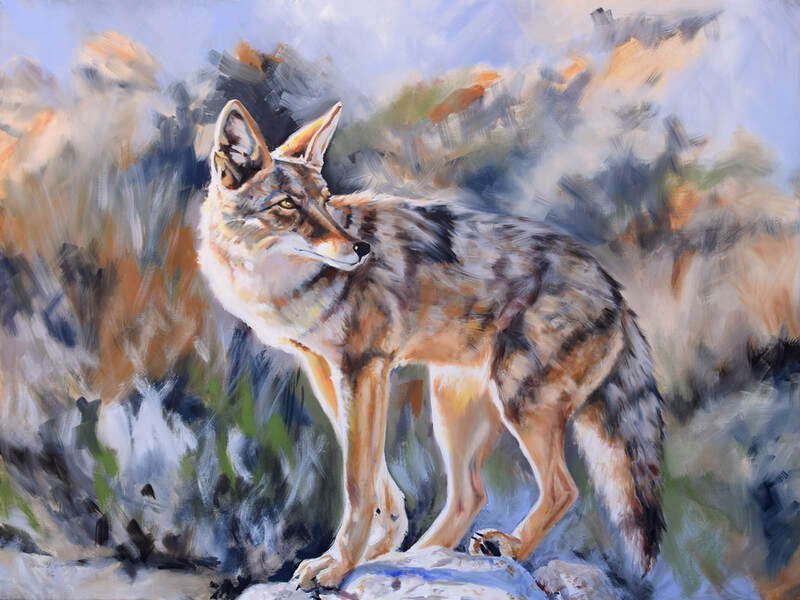 ​Artist Karine Swenson (ka-ree-nah) is inspired by the tenacity of desert wildlife. The paintings and drawings you will see here are all a result of her own encounters with the native creatures who inhabit the American Southwest. Tapping into a tradition that reaches back to paintings of animals on cave walls, she seeks to once again find a connection to our relationship with wild animals. To read more about life and art in the desert, hop on over to her blog. Swenson hikes daily, camera strapped around her neck, dog by her side, with the hope that she will be able to catch a glimpse of some wild creature. The photos she does manage to take are a springboard for her oil paintings, encaustics, and drawings. When she paints a wild animal, she strives to imbue each animal with personality and touch on the magic she feels, every time she is fortunate enough to see a wild thing. She wants the viewer to feel a connection to the wildlife - the same connection that she feels. It is her hope that these images will help others remember that we share this planet. The deserts of the American southwest are not barren places but places teeming with wildlife and beauty. The desert and its animal population is in need of our protection. Enjoy your visit! You can view Karine Swenson's other art by visiting karineswenson.com. ​﻿Join our mailing list today!